"I never thought I'd see somethin' that could tear up a Warthog so completely short of an eight-oh-eight just by runnin' into it—are Choppers put together out of old battleships or something?" The Type-25 Rapid Assault Vehicle (T-25 RAV), commonly known as the Brute Chopper or simply Chopper by UNSC personnel, is a Covenant ground assault vehicle used exclusively by the Jiralhanae. Ironically, the first prototype of the Brute Chopper was built in 2525 by a Huragok named Lighter Than Some, as a well-intentioned peace offering towards the human population of Harvest. The pacifistic Huragok built them in imitation of the colonists' mechanized JOTUN plows, intending them to be used in the same way as their human-made counterparts. These vehicles were built from parts taken from a damaged Type-25 Spirit dropship, which the Huragok had been ordered to repair. The Jiralhanae, oblivious to the Huragok's peaceful intentions, instantly took a liking to the vehicles and decided to outfit them with pairs of Type-25 Spikers for battle. As time progressed, the armament mounted on the vehicle was replaced with four 35mm autocannons, and the replacement of blades with grinding wheels. Afterwards, the Jiralhanae continued to occasionally manufactured Choppers, until Sacred Promissory took over production in 2552. The Brute Chopper is a heavily armored, one-man assault vehicle, kept aloft by a repulsor array on its rear seating and propelled by a massive pair of wheels in the front. The Chopper is designed for a variety of roles, from reconnaissance to anti-armor assaults. Its powerful 35mm autocannons can take down most light ground vehicles with ease, and the large blades on the front can instantly destroy any light armored vehicle by ramming into it. It is capable of short bursts of increased speed up to 120 kph, thanks to a pair of booster vents located on either side of the wheel. The Type-25 Rapid Assault Vehicle is both heavily armored and surprisingly fast. In the front is a massive cyclical engine, which drives the vehicle's wheels and other propulsion systems. Directly connected to it at the back is a small, exposed cockpit that provides the rider little protection. The only defense is offered by the sheer bulk of the wheels, which are large enough to protect a pilot from frontal fire. The wheels are protected by bladed cowlings, which can withstand high-speed collisions with other vehicles. The blades on the wheel are strong enough to take down and cut through any vehicle with the boost except large ones like the Type-26 Wraith and M808 Scorpion. Even if it does not destroy the vehicle, a boosted impact may inflict severe damage. When activated, the vehicle moves around by the use of two massive wheels on the front of the vehicle. To turn, the whole frontal portion of the vehicle rotates to the left or right. However, the pilot's seat is kept aloft by anti-gravity technology similar to those of the Type-54 and Type-32 Ghosts. The Chopper is frequently described as an "anti-anything" vehicle; its powerful autocannons can destroy most vehicles (except for heavily armored targets) with relative ease, and their projectiles explode with enough force to send targets reeling. The Chopper's heavily armored chassis and boost ability allow it to ram and obliterate other vehicles of equal size or smaller, including other Choppers. A correctly timed boost will destroy light ground vehicles or Banshees with a single hit and a Hornet with four hits. It works wonders against Wraiths on Halo 3: ODST provided the player has already eliminated a squad of infantry in that area. The Chopper is also compact enough to fit through tight spaces, including most doors. Choppers lack the ability to strafe; they can only turn while moving forward or backward. Other factors, like a wide turn radius add to their overall relative lack of maneuverability, as compared with Type-32 Ghosts and even M12 Warthogs, among others. The rounds of the cannons fly at a relatively slow velocity and have a tendency to arc; at longer ranges it is necessary to lead targets and aim high to compensate. The auto-cannons shoot nearly straight out of the front of the vehicle, so it can become difficult to destroy more maneuverable vehicle targets or fast moving opponents. Chopper drivers are extremely vulnerable from the back, which offers almost no shielding from enemy fire. The lack of maneuverability and low speed make the Chopper a hard vehicle to drive for inexperienced players. The boost function on a Chopper is also limited in the amount of time it can be used, and requires a rest period before it can be used again. Lastly, the Chopper has a very slow reverse speed, making it difficult to retreat. A disadvantage which does not appear in-game is the vehicle's travel range. The Chopper can drive a total of 271 km (169 miles) before it needs to refuel, which is just over a third of the range of the Warthog and Scorpion, and close to a quarter of the range of a Ghost. "Auto Cannons" - Equips all Choppers with a pair of autocannons. 200 resources and a tech level of 1. "Stabilizers" - Increases the autocannons' damage and accuracy. 400 resources and a tech level of 2. "Ramming Targe" - Greatly increases ramming damage and vehicle armor. 700 resources and a tech level of 3. Jiralhanae raiders pillaging Sangheili settlements with Type-25 Choppers during the Great Schism. The Type-25 Chopper was first deployed by the Covenant during the First Battle of Harvest in 2525. In 2531 Jiralhanae would use Choppers against the crew of the UNSC Spirit of Fire during the Battle of the Etran Harborage. Towards the end of the Human-Covenant War in 2552 Choppers were used extensively during the Battle of Earth. ODST Taylor "Dutch" Miles, with the help of other Marines, destroyed multiple Choppers at the Uplift Nature Reserve near New Mombasa. Spartan John-117 destroyed many Choppers during the Battle of Voi. The Covenant deployed multiple Choppers during the Battle of Installation 00 first in front of the Ark's Cartographer and later in front of the Citadel. With the end of the war Choppers continued to be used by various Jiralhanae. Choppers were used during War Games matches aboard Anvil Station. "Whatever kind of engine those Kongs put in there, it's heavy! You actually gotta pull the entire front end to one side to turn it! Because of observation of earlier Halo 3 builds, the T-25 RAV was first misidentified as a "Brute Ghost" (mentioned in the December 2006 issue of Electronic Gaming Monthly) or the "Mauler". At the time, the vehicle appeared to be similar in color and sound to the Covenant Ghost. However, the wings were folded up and the result was a much thicker, tube-like vehicle, giving some the idea that this was different from the original Ghost. They were proved correct by the unveiling of the Chopper, which in its final iteration bears little resemblance to a Ghost. Commentary found on the Halo 3 Legendary Edition disk relates how the Bungie team tried to make the Chopper analogous to a human motorcycle, a vehicle for tough guys, in this case the tough ape-like Jiralhanae. Choppers are a good vehicle to destroy for the We're in for some Chop achievement by destroying it with a trip mine. 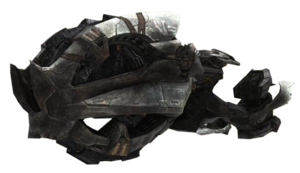 The Chopper, the Type-30 Locust, the Prowler, and the Type-47B Scarab are the only Covenant vehicles not named after some sort of apparition. Brute vehicles and weapons, however, seem to have their own nomenclature system: being named after predatory or otherwise vicious acts, e.g. chopping, and mauling and so on. Halo 2 concept art for a Chopper-like vehicle. First-person view of the Chopper in Halo 3. A render of the Brute Chopper. Views of the Brute Chopper in Halo 3. A Brute driving a Chopper in Halo 3. A glitch in which one will ride a destroyed Chopper. Concept art of the Chopper for Halo Wars. An in-game render of the Brute Chopper in Halo Wars. A group of Choppers on Shield World 0459. A Chopper in Halo Online. ↑ 1Up - Everything we know about Halo 3's single-player mode! ... the familiar whine of a Covenant Ghost howls and Master Chief lowers the Gauss cannon. But this Ghost is unlike any Ghost we've seen before. Instead of the two small wings that normally frame a Ghost, this model is more tube-like in design. The sound is unmistakable, just like its bumpy hover. There's a much larger driver at the back of this new Ghost-type vehicle -- a Brute. This is the first vehicle we've seen from what Griesemer describes as the Brute Sandbox. As Master Chief lowers the Gauss cannon on the Ghost, the demo ends.